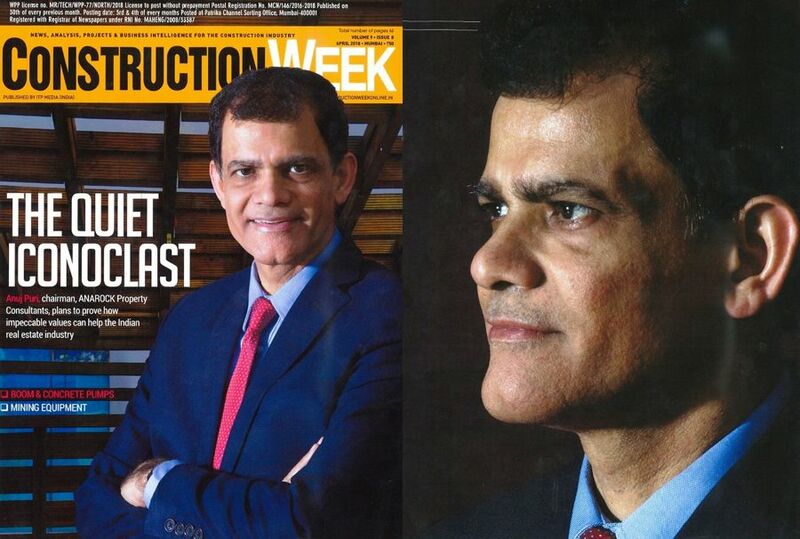 I had the honour of being featured on the cover of Construction Week magazine this month. It was an incredibly interesting interview with the magazine’s dynamic editor, Jayashree Kini-Mendez. In my opinion, only disruption can save the day for the Indian real estate sector. Both because of the groundbreaking policy reforms now in place and the changing mindset of real estate consumers, the old ways of doing business simply cannot prevail any longer. What is required are new ideas, new ways of conducting business, and a far greater focus on accountability and transparency than has been evidenced by the industry so far. ANAROCK Property Consultants is a new benchmark for impeccable values, corporate governance and customer-focus in the Indian real estate space. If one has it, the entrepreneurial streak is not something that will be denied for very long. I had to fulfil my obligations to my previous firm in the manner which the role required of me, but I always had plans for ANAROCK on the back-burner. And even here, the entrepreneur in me launched this new firm and then became its employee. Some professional situations can only be done by an entrepreneur, while others require an employee role. Often one cannot latch on to the ‘entrepreneur’ tag and make it one’s defining role in life – fluidity and the ability to me with the situation are very compelling attributes of any successful business. The (real estate) sector needs steadfastness – a great deal of it, in fact – but it should not be a forced factor but must be wired into the very DNA of the industry’s stakeholders. RERA is a belated knee-jerk reaction to the dire need for transparency and best practices in the Indian real estate industry. The need for such a rebooted mindset was evident for decades, but nothing much was done to introduce it. At ANAROCK, transparency is a way of life and a business philosophy whose benefits percolate down to our clients and the consumer. Our business practices are 100% rooted in ethical conduct at all stages, which means that our clients know exactly what they can expect from us and that their interests are fully protected not only by the new laws but also by our own unflinching dedication to giving a fair shake to everyone we deal with. This company’s brand is forged to withstand the test of time. There is a strong B2C aspect to ANAROCK as we are helping individuals and families to find the best property deals on the best possible terms. However, there are also strong B2B elements to our business, as we have the leading developers and even fund houses as clients. In fact, in many cases, we take up a developer’s entire inventory. It is an ‘everyone wins’ business model which benefits our customers and corporate clients alike. The other advantages we bring to developers’ table is our impeccable reputation for transparency and fairness among end-users and investors, and our highly-developed technology platforms that help our operatives to instantly match inventory with requirements and vice versa. These functions call for considerable capitalization as well as existing expertise and relationships. In those respects, selling inventory while simultaneously ensuring that our customers get the best deals is definitely not everyone’s game. Everything we do (at ANAROCK) is based on in-depth research. We have learned not to venture into anything – be it a geography, client or acquisition – without doing our homework. We rely on our own Research division for the necessary insights and do not depend on outside agencies. From our findings, we are able to garner necessary insights basis our deep expertise in the field. When the stakes are high, making mistakes in no longer an option, and ANAROCK has invested heavily in our research capabilities. Another area where we have built mastery is technology – we have the best real estate-specialized tech brains focused on developing an operating our technology platforms. If there’s one thing which the current times have taught the real estate industry, it is that a firm either evolves technologically or perishes. We have made huge investments – both in terms of capital and personal dedication – to ensure that ANAROCK stays on top of the tech curve so as to best serve our clients. Through our website and in-house software, we know that about 1 lakh of home buyers show interest in the properties we showcase there every month, out of which about 10,000 make actual inquiries. We have a team of 500 professionals who meet as many as 25,000 to 30,000 customers per month. Overall, our data shows us that customers really understand the ground realities about why, where and what they want to buy. Of course, sales are highly micro-market specific and a lot depends on the product. We have found that luxury is doing as well affordable in some markets. Leads are cheap in India when compared to the global scenario, but what Indian developers understandably want is sales. Instead of lead generation, we concentrate on lead management – in other words, we focus more on converting leads generated online than on just generating leads. This online-to-offline approach is, in fact, our area of highest specialization. We use our own proprietary software to analyze how long people take to buy after the site, how many times he comes to the site, what configurations and price points they are interested in, and which micro-markets are the ‘hottest’ at any given time. Additionally, we process the data available on the RERA websites and also keep a close track on what our developer clients’ competitors are doing.